This is the third in a series of 3 articles about High Speed rail in the UK. After writing about the routes to the Midlands, the North East and North West on their way to Scotland there is one grand high speed route that should be mentioned - the Great Western Main Line (GWML) to South Wales and the South West. I will exclude from this review the third rail DC routes to the South and South East together with the routes to East Anglia(Kings Lynn and Norwich) as all these routes are dominated by commuter traffic so their problematic is different. Norwich might well be the exception. 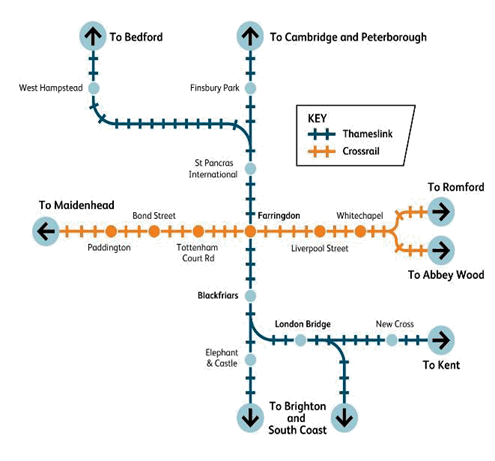 In any case most of these routes will be connected both north and south of London in the Thameslink programme. GWML: This famous line is the old GWR, or "God's Wonderful Railway", built/engineered by Isambard Kingdom Brunel. Since is was originally built to a wider running gauge than the other railways at the time it provides more space for improvement works. Also it is straighter than is the case in many of the other original lines facilitating the elevation of line speeds. It is ideal for upgrading and upgrading is what it is receiving. With the Crossrail project running from Paddington to Maidenhead this section is already being electrified and improved. Obviously the logical next step is to extend the programme to Reading to include all the local services from there into Paddington but this has not been decided as yet. Electrification of the line to Reading and on to Bristol, together with the electrification to Cardiff and Swansea has been agreed upon. 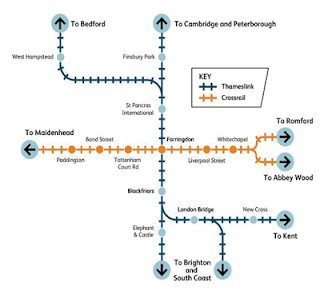 Extensions from Reading to Newbury and from Didcot to Oxford are also envisaged. These are important with respect to other proposed projects. The timetables as published by Network Rail are for completion to Bristol, Newbury and Oxford in 2016, with Cardiff being completed in 2017. No date is given for Swansea - probably 2018/19. the most densely populated parts of the country", yes, but this does not mean necessarily passing through London. Other ideas have been floated and I have compounded them into one such project which I have called the "Southern High Speed Line" (SHSL). Firstly, there were proposals to connect Reading with Heathrow airport. This was an idea based on the assumption (a) replacing the present Railair coach service run at 20 minute intervals so taking polluting buses off the roads, and (b) at some time in the future permitting GWML trains from Bristol and South Wales to run into Terminal 5. This was not a well thought out idea and was only a bit solution in any case. This I looked at on 6th October 2011. Secondly, there was a proposal to link Heathrow and Gatwick airports, provisionally named "Heathwick". The idea was to connect the two airports with high speed trains so that they could be used interdependently. It would also replace the National Express coaches from Heathrow to/from Gatwick (100 per day).This was resoundingly and rotundly rejected by the parties affected and rightly so. I looked at this case on 11th October 2011. Thirdly: add these two projects together and you can see that it is a relatively short extension from Gatwick to Ashford and the Channel Tunnel. That way you can achieve direct rail services to Continental Europe without any difficulty, to Paris, to Brussels and onwards. Is this not what the rail lobby wishes? You obtain direct rail services from the two principal London airports on some of the busiest short-haul air routes in Europe, to Paris, to Brussels, to Amsterdam and to Cologne/Bonn. Would these not end up reducing air traffic at the two airports and by extension free up landing/take off slots for other long-haul flights?All this and without transitting through London itself!! Fourthly; from there it is a small step to start thinking about the very same European rail services starting from Reading. If they start from Reading , why can they not start from Birmingham or Bristol? We know that these possibilities are more complicated logistically for passengers but not so difficult for freight traffic. So let us think about freight traffic going from the Midlands and the West of England directly to Continental Europe without passing through London - by avoiding London it means we can avoid a probable bottleneck. Fifthly; If you take the arguments from there and start to think about what traffic is through traffic, that which does not want or need to stop in England on its way to Europe, then you start to think about the traffic to/from Ireland to/from Continental Europe - both passenger, but principally freight. The non-stop passenger, car, freight rail services to/from Ashford to Calais have reduced substantially the sea ferry traffic. Since this is the case then would it not be the same for traffic to/from Ireland? Obviously there is no direct link to Ireland from Britain as yet except by ferry, but, however, would it not be quicker, more comfortable, and cheaper to provide through European services (by EuroTunnel) from Ireland to Continental Europe? Obviously, since there is no tunnel from Rosslare to Fishguard (the shortest route to Calais) the train services would have to start there, in Fishguard, meaning an extension of the ferryport to accomodate the most likely extension of the services. The train link would then be non-stop from Fishguard to Calais along the GWML, the Reading-Heathrow extension, the Heathrow-Gatwick extension and on to Ashford and the Chunnel. Would not lorry(or car) drivers find that paying for the through route by train from Fishguard to Calais better than driving that distance, considering the time, the stress and the cost? Would it not be a double winner for Britain if such through traffic were taxed on the roads so as to make the cost of travelling by road or by rail the same? Would this not be the carrot to free up the roads and also free us from the pollution if the traffic were transferred on to rail? If such a service could be provided, especially for freight traffic then could not the same be offered for freight traffic originating in Great Britain? Of course it could. A site next to the GWML railway, and the motorways outside Bristol would be ideal to service freight(and car/passenger traffic?) from South Wales, the West, the South West and south Midlands non-stop to Continental Europe. From a site near Birmingham - again next to the rail lines, the airport and the motorways - would be ideal, especially for freight traffic to run down to Reading and along the SHSL to Ashford and the Chunnel. Both projects would make a significant effect on pollution and on traffic volume. Transpennine Routes: The electrification of the Liverpool Lime Street to Manchester Victoria line (via Chat Moss) will reduce the journey time between those two cities. Agreement has been reached to extend this electrification from Manchester to Leeds and on to York. That way the through services between Liverpool and Newcastle can run under the wires for its whole length. Unfortunately, the lines from Leeds to Hull (and Scarborough) are not due for electrification so these services will have to be diesel wasting the benefits of electrification for most of its length. On the other hand trains could begin at Leeds but this is an inconvenience for passengers. Thus the line from Leeds to Hull (and possibly Scarborough) is an obvious candidate for electrification at the earliest opportunity. The third service from Liverpool runs from Lime Street through Warrington Central and Manchester Piccadilly to Sheffield, Doncaster on to Grimsby and Cleethorpes. This line is not electrified so diesels would be used. The logic for electrification is obvious since line speeds would increase substantially but the economic case has to be looked at which might torpedo any such project. Problems might well arise at the Liverpool end. The line from Wigan and St.Helens into Lime Street is to be electrified. That could well mean that intercity services from Liverpool to Glasgow and Edinburgh would restart making present constraints in the station even worse. If the demand for Transpennine services increases then the problem could become acute. Then a strong case would be made to reopen Liverpool Central station (at ground level). This is possible since the tunnel into Liverpool Central still exists and is partly used by the Merseyrail Electrics (the Mersey Tube). However, the tunnels were built for four tracks so still could be used for mainline services into a reopened mainline station at ground level. At the terminus the site is now occupied by a supermarket. This could be solved by rebuilding the supermarket on the top of the mainline station. This way overcrowding at Liverpool Lime Street station can be alleviated. The old CLC services along the line from Manchester Central, Warrington Central into Liverpool Central could be restored thus cutting ten minutes off the present timetable which is the penalty for running into Liverpool Lime Street. Obviously at the Manchester end the old Manchester Central station is not available so services would run to and through Manchester Piccadilly as at present, without any time penalty. The cross country traffic is quite substantial whether it be passenger or freight. Therefore,the main lines connecting these points are essential. Bristol to East Midlands and Southampton to Birmingham come to mind immediately. Phase 2 of HS2 from Birmingham to Nottingham (and onwards) is of paramount importance for traffic from Birmingham to Bristol and onwards. Birmingham is and will be an important interchange for passenger traffic which does not want or need to transit through London. Certain line straightening from Bristol to Birmingham would be necessary to increase the line speeds so as to make the line more attractive. 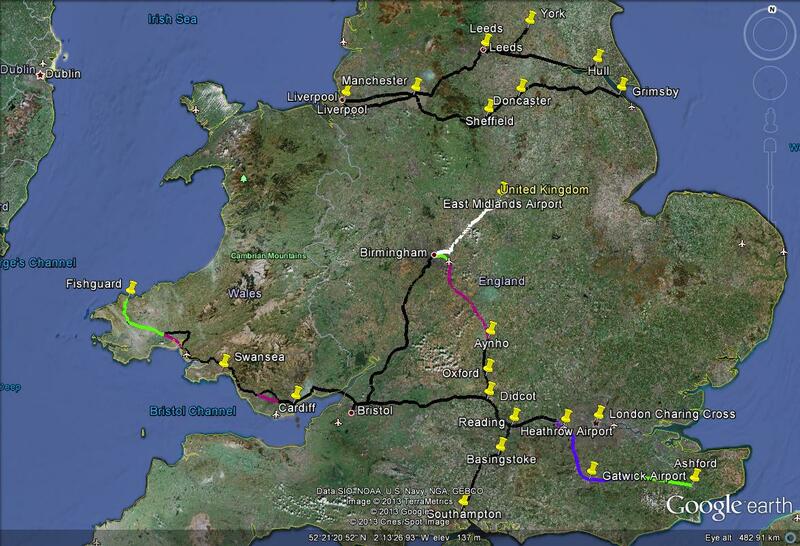 Add that to HS2 to Nottingham and then there is a strong route all the way from Bristol and further afield to Leeds. The Southampton to Birmingham line has already been targeted for freight. The first part is the section from Southampton to Basingstoke and Reading. This is three DC rail electrified. the second part is from Reading to Didcot, Oxford and Aynho(just south of Banbury and Kings Sutton) and on to Birmingham. The section from Reading to Oxford is to be electrified with AC overhead wires. The section from Aynho(or near Banbury) is to be part of HS2 from London to Birmingham. That means that all that is needed is to join the section from Oxford to Aynho - which is about 27 kms. - with overhead AC wires. This would make the connection from the South´s main port to the Heart of England and onward to East Midlands or the WCML at fast speeds a reality. The Felixstowe to Nuneaton line has also been upgraded. This, however, is mainly thought of as a way to facilitate freight traffic from the East Coast port to the ECML and WCML. The loading gauge has been enlarged so that the larger containers can transit the lines so facilitating greater use of rail freight and so fewer lorries on the roads. It is not really thought for passenger traffic as the line has not been straightened and so the line speeds are still reduced. Scotland : Obviously not all the trunk routes have been mentioned. There are three principal routes between Glasgow and Edinburgh. Which of these will be dedicated to high speed traffic as against serving local traffic is something the Scots know more about than this blogger so they will decide. They are already talking about a fast route. The communications northwards are still anchored in the Victorian era. In such a large geographical area it is essential to use rail to vertebrate the country. The main cities to be offered better communication are Inverness and Aberdeen from both Glasgow and Edinburgh. That way other important cities get connected like Dundee, Perth and Stirling. At the moment the traffic forecasts probably would not make these high speed lines through the Border region as economical as wished for.That does not mean they should not be put into effect. For that reason regional services would be ideal. With stops along the line (off the main line) passing points would be provided for. These would be for slower regional stopping trains and freight trains. That way non-stop fast trains would not be impeded. Obviously not everything has to be done at once but should be included in the plans for long term solutions. Fast rail lines fulfill a desire and a need. New and improved lines encourage people to travel by rail as has been proven in the last decade with the upgrade of the WCML. However, speed for speed´s sake is not justifiable. 400 kph. maximum running consumes enormous amounts of energy and makes turning circles so great that the lines cannot avoid any obstacle. This would mean slashing through the landscape and taking everything in its way before it. A lower maximum speed - but still fast - such as 320 kph. is more than enough for this small island. Is there a need for new lines? HS1 from the Channel tunnel to St.Pancras showed that there is a need. The previous route to Waterloo was unsatisfactory as HSR trains had to mix with commuter traffic. The question is if more HSR lines are needed. The answer to that question is mixed. If the question is line capacity alleviation then a new line has to be compared to increasing the number of tracks on existing lines. Doubling a twin track line to four track does not double capacity - it is more than that. Trains that run on the dedicated "fast" or "slow" tracks run more in accordance to the preceding and following trains so the distance between trains can be less - thus more run per hour. When increasing the number of tracks these do not necessarily have to right next to the "old" track. The new tracks can be next to or near the "old" track, but the construction would take advantage of the line(or as I have said before the corridor) of the "old" track to straighten the "new". In that way higher line speeds can be provided for. Are new lines necessary? As the command document on phase 2 of HS2 states HS2 is based on assumptions, such as having a dedicated separate line from terminus to terminus, which makes the idea inflexible, ridiculously expensive and obviously does not consider any extensions further north.This blogger considers that new lines should be built where essential but not as an end in themselves. The greatest needs are for new lines at Shap in Cumbria, from Gretna Green to Glasgow and from Newcastle to Edinburgh. At Shap the fast new section of the WCML would run through the mountains from Kendal to Shap thus cutting out the roundabout route. The line from Gretna would run near to the present WCML but seperate from it almost all of its length. The line from Newcastle would have a totally different route from the present ECML to make it much shorter as well as straighter. Nobody should balk at such suggestions as we know we are talking about infrastructure for the next 100 years (or more). The rest of new construction would be relatively short sections to improve the total journey time. The longest sections would be from Derby to Stoke, and from Ayno to Birmingham airport(if my suggestions about HS2 are accepted). Phase two from East Midlands to Leeds would have, in my suggestions, short sections coupled with upgrades. Other new sections of line are marked on the respective maps but are not of significant length. Will these solutions be expensive? Yes, but necessary. Will they be cheaper than the HS2 proposals? I do not doubt most of my suggestions would come out cheaper when all costs are taken into account. However, costs should be looked at in two distinct ways. The capital costs are an investment in improving infrastructure to satisfy the needs of the travelling public so would need to be accepted per se. The running costs of the improved services, when they are implemented, have to be controlled strictly so that the rail service for the general public can be offered at reasonable prices without necessarily losing money. It is very noteworthy that SNCF, the State French Railways announced on 20 February 2013 the setting up of a cut price HSR service called OUIGO . SNCF unveils cheap high-speed service (ref: Rail.co website). This will provide, initially, a cheap TGV service from Paris to Lyon, Montpellier and Marseille. The relevant question is why? Obviously, if all the capital costs of new projects are included into the cost of a new line then it will never maker a profit. The sales price has to be such that the clientele use the service and there can be a profitable return, the public are not scared away by the ticket prices. SNCF obviously, want to fill up the TGV lines to capacity. However, remember, the capital costs can be allayed by subsidies from the European Union to a great extent so reducing the cost to the local market. The Trans-European Transport Network Executive Agency was set up by the European Commission to help fund trans-European transport projects,so some or all of these projects qualify. "Speed not enough to entice people onto HS2"
"HS2 In Favour and Against"